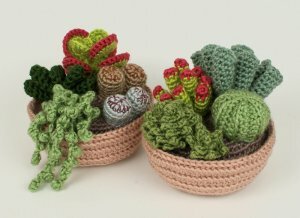 Succulent Collections 1 and 2 are original crochet patterns by June Gilbank. Details: each pattern is 15-17 pages long and includes over 30 step-by-step photographs and explanations so you can crochet perfect succulents of your own. And you can mix and match the patterns with Cactus Collections 1 & 2 and Succulent Collections 3 & 4 to create your own custom garden! Date Added: 12/30/2018 by Sara P.
Date Added: 04/10/2017 by Emilee M.
Date Added: 10/03/2014 by Loretta M.
Date Added: 07/02/2014 by Elizabeth B. Date Added: 09/26/2013 by Kaitlyn K.
Date Added: 02/12/2012 by Katalin G.